The world is evolving, and with theworld other things are also evolving, such as Currencies. In theModern world, People use the modern currency which is Cryptocurrency to make their online transaction more fast and secure. Cryptocurrencies are on the rise, so People are investing a lot of money in cryptocurrencies. There are also companies which are trying to make your online investment more secure;Ledger is one of them. Being a company of the modern era, Ledger specializes in cryptocurrencies and blockchain applications security, and they have introduced several products in this regard, Ledger Nano S is one of them. Ledger Nano S is a Bitcoin, Ethereum, and Altcoins Hardware wallet, which ensure the security and safety of your Cryptocurrency and online transactions. Ledger Nano S is studded with many stateof the art features such as OLED display to display your private keys and double side buttons to confirm your everytransaction. Ledger Nano S feel thevery good built quality and feel premium although its price is very nominal. What makes the Ledger Nano S the best wallet? Multi-Currency, Ledger Nano S supports multiple cryptocurrencies at the same time. Ledger Nano S supports the cryptocurrencies like Ethereum, Bitcoin, Ethereum Classic, Ripple, Stratis, ZCash, Litcoin and few other Altcoins. Ledger Nano S is an HD wallet which is an abbreviation for Hierarchical Deterministic. HD wallets are very effective as they increase your usability. In Ledger Nano S, all you will have to remember one backup key,i.e., Seed key. It will protect your financial privacy by changing your receiving address every time. Ledger Nano S is compatible with all operating systems. 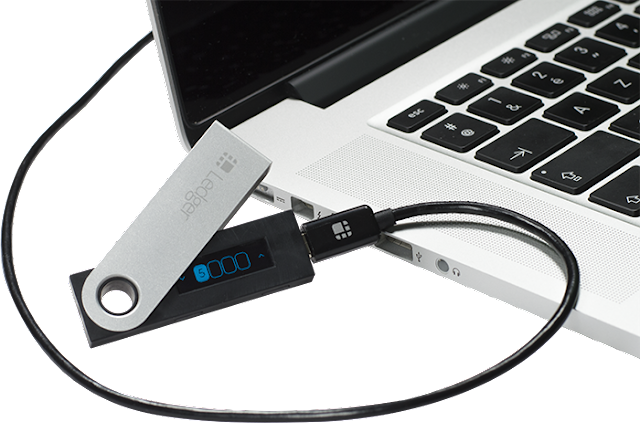 Ledger Nano S support the Windows, Mac, Linux and Chrome OS. You can also connect it to your Android device using OTG. You can also receive your payments even if your Ledger Nano S is not connectedto the computer. FIDO Certified, Ledger Nano S also supports the FIDO Universal Second Factor authentication standard on GithHub, Dashlane, Google, and Dropbox. Ledger Nano S features a couple of physical buttons to confirm your transaction. These buttons add the extra layer of security to your payments. Let’s assume even if your computer is hacked; hacker can’t confirm the payment as it will not be accessible to the hacker, the main vulnerability of online wallets is that they can be hacked. Yes, they use state of the art encryption technologies but still,a good hacker can find his way into the wallet, and this can hurt your pretty bad financially, so these buttons on the Ledger Nano S are very important. Ledger Nano S also features the Pin Code, which will be created on setup. This Pin Code will help to make your Ledger Nano S secure if it gets the hands of wrong people. Ledger Nano S Pin Code will protect itself and bar the intruder from sending Bitcoin or other stored Cryptocurrency, and after three incorrect guesses, the device wipes itself. The main purpose of the hardware wallets is their ability to store your keys offline. Ledger Nano S have the security features which make your Cryptocurrency more secure and safe. Ledger Nano S’s screen also plays an important role in adding more security to the Ledger Nano S. When you setup your Ledger Nano S; your wallet will generate recovery phrase which will be a complete backup of your wallet. Here come the Ledger Nano S’s screen which displays your recovery phrase, unlike other wallets, recovery phrase is shown on the screen which can be captured via the Keylogger, or someone can hack it. Ledger Nano S’s screen will also show the amount of the Cryptocurrency which you will transfer. You can also use your Ledger Nano S on the computer which is infected with malware. You can start your setup process by plugging Ledger Nano S into your computer via Micro-USB Cable. In the first step, you will need to create the four digit pin code using the Ledger Nano S’s screen with the help of buttons. Once done with the Pin Code you will need to press both buttons at the same time for confirmation. However, you will need to repeat this process one more time for confirmation. Now it’s time to use the Recovery Sheet which will come with the box; Ledger Nano S will display the 24-word recovery phrase, you will have to note down your recovery phrase. For your assistance, screenwill show one word at a time; you can use the right button for the next word. After this process Ledger will ask randomly about a couple of words from your recovery sheet, and you will need to scroll through the words and press both buttons for confirmation. You will need to install Ledger Chrome Application to access your wallet. Now you can do transactions from your Ledger Nano S.
Ledger Nano S: Is it worth it? Ledger Nano S is the best Bitcoin wallet. It is an awesome device, and it will make sure that your Cryptocurrency is secure. Features like the Pin Code and Physical buttons add a great protection to the Ledger Nano S. Displaying the recovery phrase on the screen is genius which means no one can hack your Ledger Nano S, All you have to do is to keep the Recovery sheet at avery secure place that is accessible only by you. The price of this great little device is just 58 euros, which is remarkable. The features you are getting for this price point is true Bargain and you won’t find such features at this price point. We recommend Ledger Nano S.